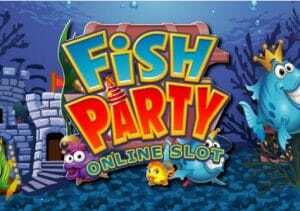 Join a gang of funky sea creatures deep below the waves in Fish Party, a 5 reel, 243 ways to win video slot from Microgaming. Available on desktop, tablet and mobile, this underwater soiree comes with stacked wilds and a bonus feature that awards up to 40 free spins with super stacked symbols. See if there’s treasure at the bottom of the ocean from between 30p and £15. Fish Party is a beautifully designed game – set against a backdrop of the ocean floor, the reels include a selection of cartoon-style aquatic life. There’s no playing card filler, all of the symbols are unique and decidedly aquatic. Look out for a selection of fish, worms, crabs, clams and treasure chests. It’s all bright, bold and rather lovely. As is the soundtrack that bounces along in the background. Joining the standard symbols is the Fish Party logo (a castle which you might see in an aquarium). This can land on all 5 reels and replaces everything bar the scatter. It can land fully stacked in the base game and bonus feature and offers some excellent winning opportunities. Land 3 or more of the scatter (the clam) anywhere on the reels and you’ll trigger the Free Spins feature and be awarded up to 20 free spins. As in the base game, the wild symbol can hit fully stacked to fill entire reels – as can the Blue, Purple and Yellow Fish and the Treasure Chest symbols. Land a good stacked combination here in conjunction with a stacked wild and some great results are possible. Land 3 or more clams during the feature to trigger up to 20 more free spins giving you up to 40 in total. Fish Party isn’t the most exotic offering you’ll come across – it’s very easy on the eye and ear which makes it an easy play. The bonus feature isn’t the easiest to trigger but has the potential to be lucrative thanks to the super stacked symbols. We’d put the variance in the medium to high range. We found plenty to enjoy in Fish Party – with lovely design and simple gameplay, it’s just the job if you fancy some tranquil, relaxing slots play. If you like the theme, IGT’s Lucky Larry’s Lobstermania 2 or NetEnt’s Lucky Angler are worth playing.